Can doing the right thing ever be wrong? For free-spirited Cat Gallagher, having a roof over her head usually involves a spot of unofficial house sitting. Cat lands on her feet once again when she discovers a deserted villa in the Irish village of Lissamore. But when the new owner unexpectedly arrives to take possession, Cat needs to think fast to avoid being thrown out on her ear. Rio Kinsella is also in a predicament. When an old flame turns up on her doorstep, the future seems rosy, but Rio soon finds out that nothing is ever simple – especially where love is concerned. Can both women find a way through their problems? That Gallagher Girl takes us back to the memorable world of Lissamore with another heart-warming tale filled with a wonderful cast of characters. 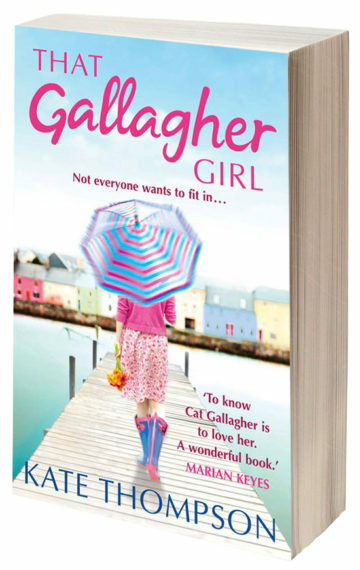 ‘That Gallagher Girl’ by Kate Thompson – Ireland AM’s Best Books of the New Year – Number One Pick.